President Donald Trump is calling for an end to “chain migration” along with tighter legal immigration control, but what exactly does that term mean? President Donald Trump is calling for an end to “chain migration” along with tighter legal immigration control, but what exactly does that term mean? The misconception is that any immigrant can bring as many family members as they would like when they come to the United States. In actuality, the process is much lengthier, in some cases taking up to 23 years, and is limited to certain family members. 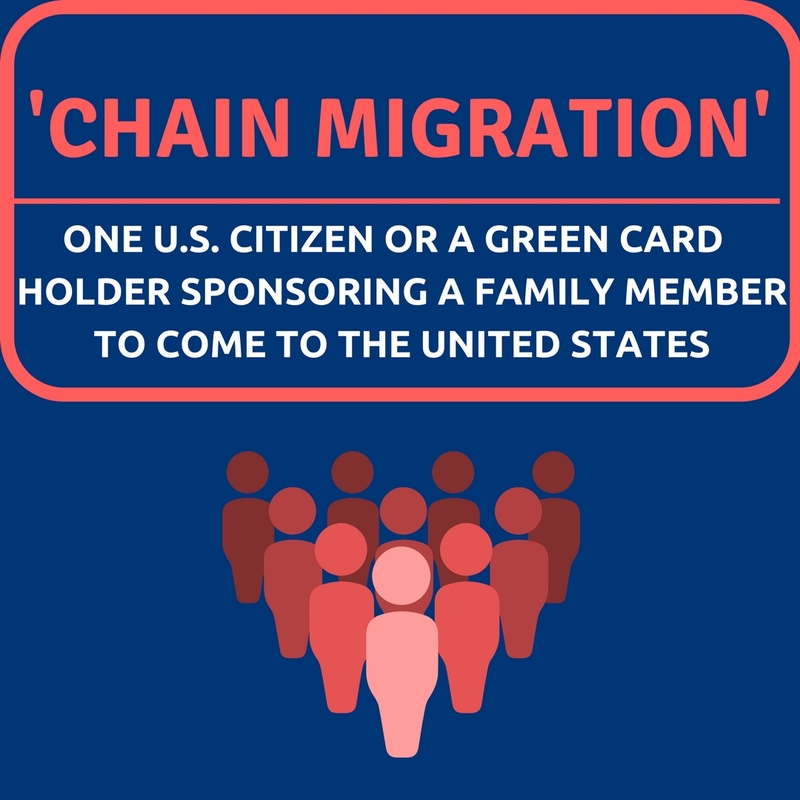 United States citizens or lawful permanent residents (green card holders) have the ability to sponsor a family member to come to the United States. Lawful permanent residents are only allowed to sponsor their spouses and their children. The amount of time it takes to process a petition for a child depends on their age and their marital status. The application to bring an unmarried child over the age of 21 takes 5-10 years longer to process than for a child under 21. In total, the United States grants 700,000 visas universally every year. Each country is allowed a maximum of 7% of the total number of annual visas. The United States has a population of 325 million, ranked number three behind China and India. The number of visas granted annually is about 0.22 percent of the United States’ population. The amount of time it takes for a petition to be processed can range from 2 to 23 years, depending on the country the person is coming from and their relationship to the benefactor. According to the U.S. Citizenship and Immigration Services Visa Bulletin, the current wait time for an unmarried child from Mexico over the age of 21 is 22 years. In comparison, the wait time of a spouse or child under 21 from Mexico is about two years. 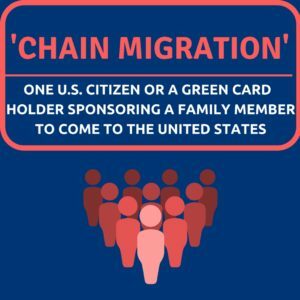 The term ‘chain migration’ has become an area of contention among Republicans, Democrats and immigration advocates. As shown by the Google Trends graph below, “chain migration” has been used more frequently since President Trump took office; however, the concept is not new, it was more commonly known as “family reunification.” “Family reunification” has been a foundation of immigration law since Congress passed the Immigration and Nationality Act in 1965. This act gave a preference to family-based immigration by stating that 74 percent of visas granted annually are to be family-based and the other 26 percent are to be employment-based. There isn’t a relationship between “chain migration” and DACA. DACA is a program designed to protect the recipients from being deported. In order to petition for a family member to come to the United States, a person has to be a lawful permanent resident or a U.S. citizen. DACA does not grant someone this status, therefore, they do not have the ability to petition for one of their family members to come to the United States.